Founded in 2008, BP Aero has become the world’s most trusted service provider for aircraft engine disassembly, engine part overhaul and engine lease return. 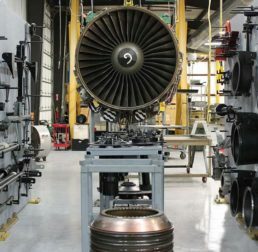 Prior to BP Aero’s start, Dennis and Michael Walsh recognized insufficient capacity for engine dismantlement and limited options for engine part repair. They made a goal to become a world class engine disassembly service provider and later bring an MRO operation online. In early 2009, the search began for the necessary assets to support commercial aircraft engine disassembly. After nearly 18 months of searching and planning, the first engine arrived for disassembly. Upon arrival of the engine, there were only two employees in the company, father and son. Each year since, BP Aero reinvested by adding tooling for other engine models, by purchasing specialized equipment for engine part overhaul and, most recently, by quadrupling their shop floor footprint. In 2012 BP Aero reached a major milestone by receiving an FAA 145 MRO certificate for engine part repair. This increased BP Aero’s support of the industry’s needs for end of life care and engine part return to service, greatly aiding and facilitating disassembly customers “speed to market” needs. In 2014 BP Aero completed construction of a dedicated building to house the component MRO operation. Five years later, BP Aero’s component repair operation has grown to a two shift operation, supporting parts companies, airlines and engine overhaul shops around the world. In 2015, BP Aero recognized an industry need for engine lease return services. BP Aero purchased land across the street from buildings 1 and 2. BP Aero applied for another FAA 145 MRO certificate and construction commenced on a 100,000 square foot facility in 2016. After two years of planning & construction, significant assets were moved into the facility and BP Aero was awarded their first customer for the lease return business. BP Aero is now recognized as the industry’s only independent service provider to be able to support airlines, engine overhaul shops, leasing companies and parts traders with multiple maintenance offerings. Mike began his aircraft engine career as an intern at GE Aviation Materials. He learned the fine art of broker trading and became an expert in the supply demand models related to GE’s Engine Families. Moving to Grand Prairie Accessory Services, he held a number of positions in logistics and engineering before assuming the Directory role in Accessory Trading and Brokering. In 2007 Mike opened GPAS’ Distribution Channel in Asia and moved to Sydney, Australia. Upon GPAS’ divestiture to the Triumph Group, Mike became Triumph’s lead agent for its APU lines and logistics management for Singapore, Malaysia, and the Far East. In the latter part of 2008, Mike returned to Dallas Texas to become a founding member of BP Aerospace, LLC. Dennis has enjoyed several roles in the aircraft engine industry spanning 4 decades. From his early days as a process engineer at Howmet and Precision Cast Parts, he developed processes to manufacture structural and gas path investment castings. Joining GE Aircraft Engines, Dennis held increasing roles of responsibility including, Castings Development Quality Manager, Production Engineering Manager and lastly Business Development Manager before assuming the leadership position at GE Accessory Services, Grand Prairie. In 2002 Dennis led a team that bought and privatized Grand Prairie Accessory Services which he grew to the world number one non OEM Accessory Service Centers in terms of capability, capacity, and turn time.